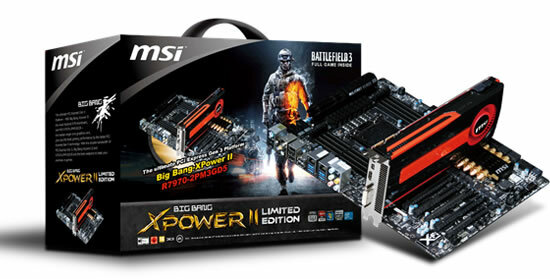 MSI announced today the world’s first PCI Express Generation 3 bundle, meeting gamers’ desire for superior computing performance with its flagship mainboard – Big Bang-XPower II, the top single-core graphics card – Radeon R7970-2PMD3GD5, and the hottest PC game of 2011 – Battlefield 3! MSI’s Big Bang-XPower II adopts a 22-phase power supply design with 7 expansion slots complying with the PCI Express Gen 3 specification. The R7970-2PMD3GD5 is the world first PCI Express Gen 3 compliant graphics card that incorporates MSI’s proprietary Afterburner software, allowing GPU voltage adjustment for greater overclocking potential. This limited bundle comes with one of 2011’s top game, Battlefield 3. Through the hardware of this bundle and Intel’s second-generation Sandy Bridge-E series CPUs, a comprehensive gaming experience can be enjoyed based on the latest PCI Express Gen 3 specification running at 32GB/s bandwidth, twice faster as its predecessor. 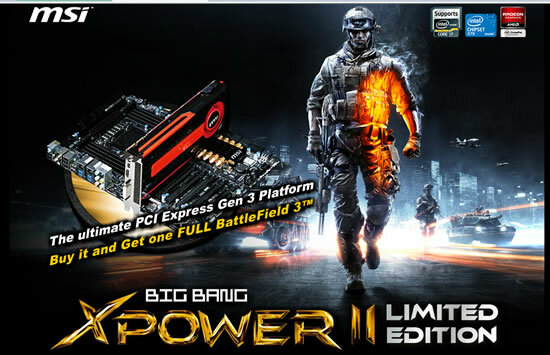 This limited bundle is the ultimate choice for experiencing the power of PCI Express Gen 3 platforms as it contains the MSI Big Bang-XPower II mainboard and R7970-2PMD3GD5 graphic card with a gift of the PC game Battlefield 3!